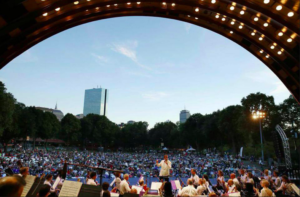 Join the Longwood Symphony at Boston’s iconic Hatch Shell at the Charles River Esplanade as they recognize the work of Greater Boston Physicians for Social Responsibility and International Physicians for the Prevention of Nuclear War. The free concert will be held on Wednesday, August 8 from 7:00pm — 9:00pm. Bring your blankets and help us work toward a world without nuclear weapons. This event falls appropriately between the anniversaries of Hiroshima and Nagasaki (August 6 and 9, 1945, respectively). For more information on venue location and transportation to the event, please visit the Boston Landmark Orchestra website.